Weather like this definitely calls for comfort food. I busted out the crockpot and threw together an oldie but goodie. I don't even remember where this recipe originally came from - I've been making it a long time and have done a ton of tweaking to it anyway. The key is, cut the vegetables in big chunks so they don't get mushy and fall apart. It still doesn't make for a pretty picture, but it tastes damn good :) and there's always plenty of leftovers. You'll get about 5-6 nice sized portions out of this recipe. Enjoy! I made it tonight too. 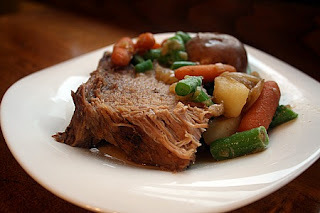 The meat was tender, the potatoes and carrots were soft, and the green beans were not mushy, so we were happy with that. But we thought it wasn't as flavorful as we hoped. I had 3.8lbs of meat - maybe a second envelope of soup mix would have helped. I also tried to thicken the sauce/gravy a bit by blending some of it with flour and returning to the crockpot to continue to cook. My husband remembers his mother's pot roast having a thicker gravy, but I didn't quite duplicate that. i did - seasoned with salt, pepper and added some garlic powder, on both sides. Those are some big 'shrooms! You can never have too many cookies. The best Christmas cookie ever!